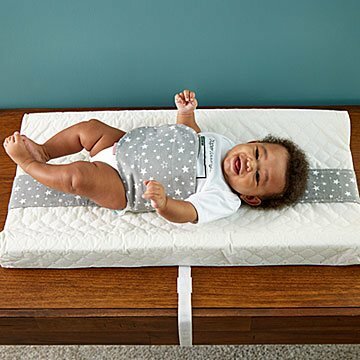 Diaper duty might just be delightful with this clever design that keeps baby secure. Babies: They're still figuring out this whole legs, arms, and head thing. Stephanie Ann Shumway created this clever wrap to help keep her wiggly baby secure during diaper changes (parents, you know the challenge). Each is handmade from cozy cotton with sturdy hook-and-loop fastener strips. It's a great gift for a new parent, or anyone who could use an extra set of hands while changing their little one—aka all parents. Handmade in California. When Stephanie Ann Shumway turned her back for one second, her newborn nearly squirmed off the changing table. She thought: There has to be a way to keep babies safe and secure during diaper changes. Thus, her innovative Wiggle Worm Wrap was born. Stephanie calls it her “extra set of hands” when she’s on diaper duty. Now, all parents can have a little help and peace of mind while changing their little ones. Stephanie lives and designs in San Francisco. Secure hook and loop fasteners before washing and/or drying. Machine wash cold with like colors. Tumble dry low or hang dry to avoid pilling. Warning: Falling Hazard. Never leave your child unattended. Excellent help for tired fathers in the middle of the night! It's in baby's room. Excellent product.